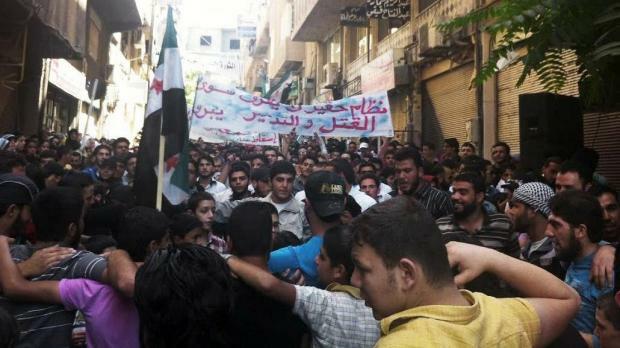 In this citizen journalism image provided by Shaam News Network SNN, taken last Friday, Syrians chant slogans during a demonstration in Damascus, Syria. On Sunday Syria denied U.N. claims that government forces used heavy weapons during a military operation that left scores dead. Partial translation of Arabic on the banner reads, "a horrible regime, killing and destruction." The government has strongly condemned the massacre which took place in the Syrian town of Tremseh, killing more than 200 men, women and children. The government also urgently called for the UN Monitoring Mission in Syria to be allowed to investigate what happened and establish who is responsible for the attack. These atrocious acts must not occur with impunity. Malta called on the international community to adopt measures through the United Nations Security Council to bring this 16 month conflict to an end, through the effective application of the peace plan for Syria of the UN Special Envoy and the Arab League.